House music fans at Evolve. After Oakland's rave scene fizzled out in the 1990s, some electronic music fans grew accustomed to crossing the Bay Bridge — and sometimes driving all the way to the peninsula —to get a fix. The conventional wisdom held that dance music had become a members-only affair, marked by high cover charges, touchy nightclub security, and annoying dress codes. But in fact, dance music never left Oakland. It just became less visible. And now it's coming back up. 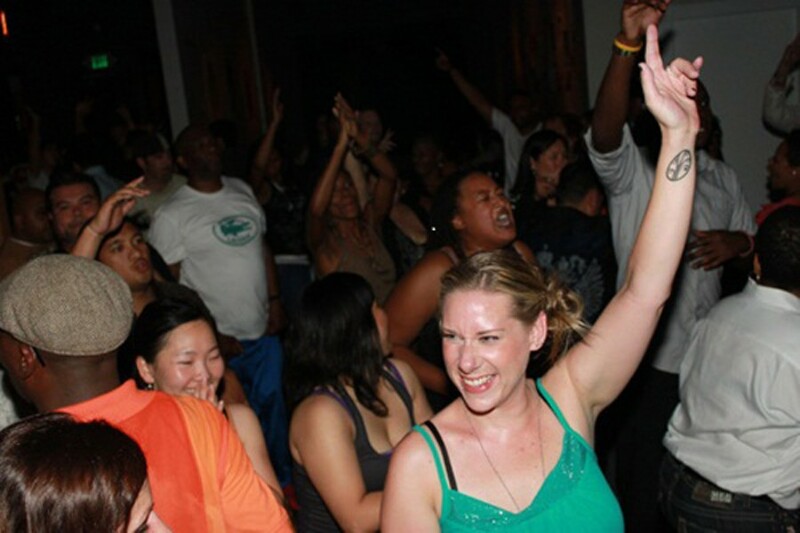 In recent years, Luka's Taproom, Air Lounge, Bench & Bar, and Club Oasis have all hosted dance music events. The People Party at The New Parish has become a popular local staple. One of the newest editions is a monthly party called "Evolve," which happens every second Friday at Era Art Bar. Topping out at an estimated four hundred people, it's attracted electronic music fans from all over the Bay Area, and made Oakland a destination for soulful house. Few people understand the genre as well as Evolve founder Soul Luciani. A Boston native, Luciani began attending underground house parties in his hometown during the early-Nineties, then taught himself how to DJ. He built a strong following on the East Coast before moving to the Bay Area a few years ago. Luciani wanted to pursue the same career out here, and thought it would probably be viable. Oakland wasn't yet bursting with nightlife infrastructure, but it had the raw ingredients. "I find that for me I just gravitated towards this area and the demographics here," Luciani said. "And it's really clicked." Luciani added that he considers himself more of an ambassador than a transplant. "It doesn't feel like it's a trendy thing. There are people here who live in the same manner — like music is life." The shelves lining the walls of Luciani's house show that he's been crate digging in record shops for a long time. He said he'd emerge from record stores with his hands dirty and his clothes covered in dust from pawing record jackets all day. His collection includes everything from Seventies rock to reggae to old soul. And it's not just for show — Luciani is one of the few DJs who insist on spinning real vinyl, rather than leaning on Serato software. Perhaps you could tie that into his philosophy, which is about purity and accessibility. It dips into some of the old spiritual credos of house music — that anyone should be able to feel the groove, regardless of age or race or background. It's a great thing, Luciani said, to see a middle-aged lady do a hand-stand to good music. (And it's something he's apparently witnessed.) But success in Oakland didn't happen overnight. Luciani didn't have a lot of name recognition on the West Coast, so he wasn't able to secure a residency at any of the established dance events. So he started one of his own. "I got a little discouraged, and one day I was sitting at home playing music and I was kinda like 'Man this music is too good, like it makes me feel bad to just be sitting at my house and not sharing it with the world,'" said Luciani while reminiscing on his first attempt to bring more house to Oakland — a Sunday brunch party called "This Must Be the Place" at 2022 Club. It attracted a consistent crowd and persisted for several months. Luciani was reticent to talk about its eventual demise, which he blamed on low revenues. At any rate, all the pieces fell in place at Evolve, and the experience speaks for itself. Three hundred people of every listed race and gender packed into the mid-sized bar at the March 11 edition. Two dance circles broke off from the crowd, and breakdancers battled amid a sea of bobbing heads. At one point, Luciani played Chaka Khan's 1984 hit "Ain't Nobody," and had everyone in the club singing along. East Bay native and eleven-year dance music veteran Rahiem Jihad is one of Evolve's trio of resident DJs. He listened to hip-hop growing up, but found himself at a crossroads when he discovered DJing in the late-Nineties. He's been through the gauntlet plenty of times, and shifts his focus between bookings in San Francisco and Oakland. Jihad said he began DJing of his own volition, even though it was also a family trade. Jihad's father, also a former DJ, would let Jihad use his old equipment. "You know its funny, it clicked in me when he broke out these old turntables and a mixer," Jihad said. "And when I saw he still had his reel-to-reel tape deck [and] ... a bunch of other equipment ... it all came back to me." Another Evolve DJ, David Harness, is a twenty-year veteran of the house circuit and a recent transplant to Oakland. Harness' infatuation with house began in the late-Eighties while studying communications in Los Angeles, and got his big break in the early-Nineties. Now a successful producer and international artist, he still recalls a series of under-the-radar parties in East Oakland during the early-Nineties at a venue called Stanley's. "That really made an impression to me of what Oakland is all about," Harness said. The effect Stanley's had on Harness continues today, and it's one he's trying replicate with Evolve. "We're all trying to provide the best sound and the best party for Oakland to give 'em a good time each month," Harness insisted. For his part and of his fellow house heads, Jihad would agree that the dance music scene in Oakland is on the rise. And there's definitely a market for it, he added.